and have any of you run heads having an exhaust valve guide saving vane welded inside the port? anyone even running 600 or so cc's at a CR of 10:1 or more? what various methods have been employed in the pursuit of speed and/or more displacement... what known weaknesses or strengths frown upon or favor the various methods... and have any of you run heads having an exhaust valve guide saving vane welded inside the port?... anyone even running 600 or so cc's at a CR of 10:1 or more? Herb, Upgrading engine performance beyond manufacturers design requires engineering and trial and error too. I did do this with my engine, using a limit which was that the engine could have no outward signs of the modifications. If you have set no such limit, you have more options. I determined that the engine could not derive much more horsepower from more RPM, the crank design just cannot tolerate much more, so I went with torque modifications. I made extensive use of a Dynojet Dynamometer to verify results of each mod. I would list modifications basically in order of practicality: 1..Lighten the flywheel... faster acceleration, easier shifting, faster deceleration, harder starting 2..balance the engine... smoother, will tolerate higher horsepower without shaking apart 3..Increase the compression/hotter cam... I went to a 328 cam and 10-1 compression. Do it together or the engine will ping all the time. As you know, a milder cam increases compression due to less valve overlap, a hotter cam decreases compression...valves are open longer in the cycle. One must engineer this change or it will be a very costly trial and error experiment. 4..Go to Mikuni flat slide carbs...this also must be engineered, bigger is not necessarily better, but the adjustability and flow design is much better than the stock carbs.. 5..Go to dual plug ignition...higher compression...helps control flame front and will allow higher compression before pinging sets in. The domed piston of the R69S create a squish problem and shrouded flame front that limits the efficiency of the combustion chamber, dual plugging starts the fire from both sides at once, doubling flame speed and decreasing pinging. This mod will substantially weaken the head, not good for reliability. Experiment with plugs to get the coolest plug that will not soot up. Remember...the coolest plug is used in the hottest engines. I use a racing plug that has no recess in it at all! I also have to use 110 octane leaded CAM2 racing fuel in the engine! Keep this in mind when engineering...this fuel costs about $5 per gallon. Plugs last about 1000 miles in this environment before they foul out from lead. 6..lighten the reciprocating mass...use custom pistons with lightened skirts, titanium valves, special springs, cast titanium rocker arms, moly push rods, custom lifters, etc. Bad for longevity, very expensive, probably gives little horsepower but will increase acceleration and top end a little. It is neat to know that technology is in there! I did make custom titanium roller rockers and push rods, cost... about $2000. 7..Add-on systems such as turbos, superchargers and nitrous injection. These things will probably crush the crank but sound good at the biker bar! These are about it unless you want to go full race, which would be better done starting with a sleeve bearing, pressure lubed engine. My engine cost about $10,000 to date(I modify the engine continuously, it is currently only generating about 55 rear wheel horsepower form the original 35 or so at the rear wheel) which is an esoteric exercise, not good value for the horsepower, just fun as a toy. This discussion needs to be much more technical to be of any use as a guide. This is more just a discussion of the pros and cons and issues involved in performance tuning a /2 engine. Here's all the BMW ratios I have heard of. The 2.909 is your 2.91, and that's the tallest BMW drive made. anyone know? grenaded one of these in spectacular fashion before, for some reason other than slingers? I think that would be enough and I'd guess such a set up is about unobtainium? I'll look at some 600 cylinders and see if they will hold such a sleeve or do you know if that has been done already? you ever use any hard machinable plastic shaft couplers instead of the rubber ones? I think the plastic shaft couplings are for 250 singles, my old R26 had a white one. Whether they're man enough for your project I doubt, they'd probably split the first time you changed down. 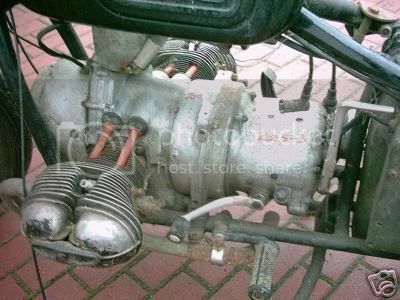 There are still 700 car motors about, they used to be a popular conversion into the plunger frame (not the Earles fork type one though), and being based on the R75 would stand some tuning I would think. Theres one for sale in the UK now, new for GBP1200, but a secondhand one would be cheaper, theres also a 51/3 frame up on ebay.de that has the special sump with it, but that would not be difficult to make. One added bonus would be the electric start! 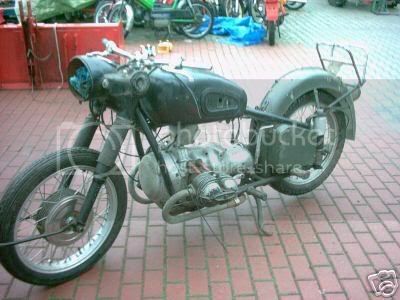 Presumably if it was feasible to take the bike motor of the time out any further BMW would have done it, as they used bike derived engines in the Isetta 250/300 and 600 and they would not have developed another motor without good reason, being bankrupt at the time. I can't see why anyone would go to this much trouble if the standard motor would just bore out to 750. I don't think you can mate an Earles type gearbox with a plunger rear drive, wouldn't your bike go backwards? and do you think I should shine these up and ditch the Koni's? Difficult to get any perspective on the gearbox but I would guess 250/300 Isetta, and as for the AMC candlesticks, should you ditch the Konis' for them, er.... no. 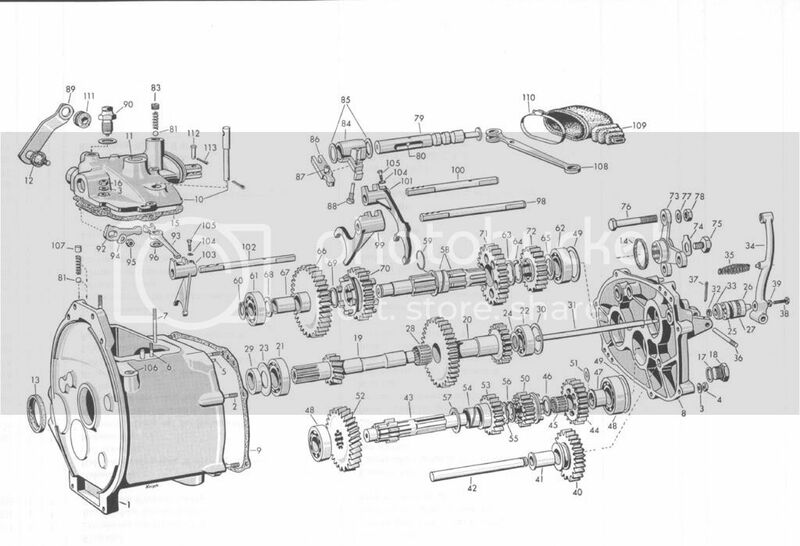 Yeah looks like it, 250 Isetta gearbox. what do you have hiding under those BMW shrouds on your Velo? now, where is the good point to measure for the 1/4" offset difference on the pre and post 68 final drives to make certain that is what they are? just the same as in your pic with the candlesticks, regular Konis I put on in about 1985. Sorry, cannot help at all there, don't know anything at all about such modern stuff, by post '68 do you mean /5?. I would start by measuring from the shoulder of the splined shaft that mates with the hub and the input shaft c/l. then the input bell housing face and the spindle c/l, and the input shaft c/l and the face of the brake actuator spindle boss in the drum and look for any differences there to known units, like you have, thats just a suggestion. Doubt if the swinging arm is different, you'd need a shaft with two Hardy-Spicers, unless its just a slimmer tube, therefore the difference would have to be in the rear drive case between the input c/l and the output shaft shoulder, thinking about it, you'd need a different spindle too, surely, and the rim would have to be offset by 1/8", like on a bendy Norton. You live and learn, I'd never heard of this modification, but then, living on this side of the water, I've never seen a US fork bike either.